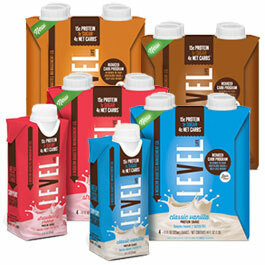 Stacy Tilton Reviews: Level Foods - Cut the Sugar keep the Sweet! Level Foods - Cut the Sugar keep the Sweet! I was sent a Level Foods premier bundle pack of sweet snacks for my family and I to try out and I have to say I was surprised at how well it went over with my kids. 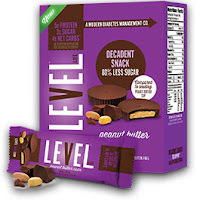 Level Foods specializes in low carb/low sugar treats that are perfect for those that need to watch their sugar intake. The program was actually designed for people with diabetes, but is great for anyone that's trying to watch their sugar intake or is looking for a better way of snacking. You can learn more about the actual LEVEL Life Program on their website. I like them because they are a better alternative snack for my kids than sugar packed treats like candy bars. They are also very portable and great for dropping into lunch boxes because none of the products require prior refrigeration, they are all shelf stable. I actually liked the flavors of the protein bars over any I've had before. They don't have that gritty bland taste to them like some do. The protein shakes were nice and smooth and great over a glass of ice for breakfast. I personally wasn't too fond of the glucose gels I thought they were too sweet, but my husband on the other hand really liked them so I've been including them in his lunches at work. It's really another example of different people have different taste preferences. Of all the standard line of products we received my favorites from each line was the Caramel Chocolate Peanut Protein Bars, Vanilla Protein Shake, and Strawberry Banana Glucose Gel. 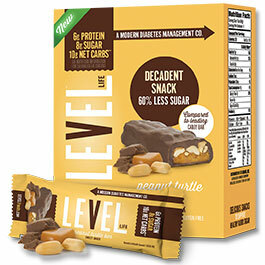 Also as part of my package I received the new LEVEL Life Peanut Butter Cups and Peanut Turtle Bars. Now this was my favorite part of them all! They were awesome and delicious! Plus I knew I was making a choice that was better for me than the actual chocolate candy counterpart you find in the stores. I actually hid the Peanut Turtle Bars for myself because they reminded me so much of the turtle candies that I so love. LEVEL Life Protein Bars are great tasting, precisely formulated snacks that fight hunger, help fight high blood sugar and are formulated for a low carb diet. They're low glycemic and gluten free. Flavors: Caramel Chocolate Peanut, Chocolate Peanut Crunch, Double Chocolately Chip Protein Bars, and Chocolately Chip. Flavors: Chocolate, Vanilla, Strawberry, and Caramel. 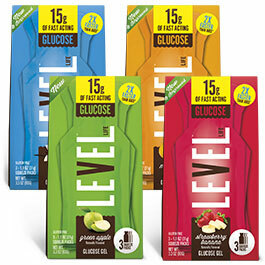 LEVEL Life Glucose Gels quickly raise low blood sugar without the risk of over-treatment by using the perfect amount of carbs. Every easy-to-carry squeeze pack contains 15g of fast-acting glucose to precisely treat lows. Flavors: Strawberry Banana, Mandarin Orange, Vanilla, and Green Apple. 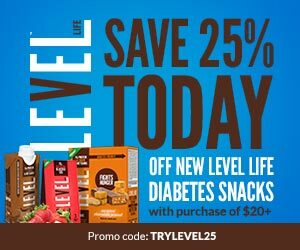 Buy it: You can purchase Level Foods online, and with the special promo code TRYLEVEL25 you can save 25% off your order of $20+. Or you can find a retailer near you through their online store locator. Make sure you print off the valuable coupons on their website before you go shopping! Peanut Butter Cups? Good tasting, less sugar Peanut Butter Cups? Count me in. We all need less sugars in our diets. I would love to try the Chocolate Peanut Crunch Bars. They look yummy! The protein bars sound like a great solution for snacking! I would really like to try the Peanut Turtle Bars. Everything looks great! I want to try the peanut butter cups. They look awesome! I'd like to try the Chocolate Peanut Crunch flavor,, and the Strawberry Protein Shake. Thank you for the review! I would love to try the Caramel Chocolate Peanut Protein Bars. This sounds great. I would love to try the LEVEL Life Peanut Butter Cups. 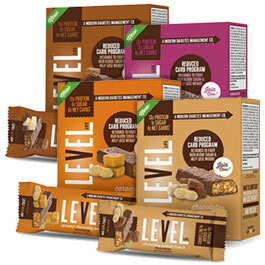 I would love to try the Caramel Chocolate Peanut LEVEL Life Protein Bars. Chocolate Peanut Crunch flavor sounds really great love to try it.